Ladies and Gentlemen, I have a new favorite treat. Homemade spicy honey-roasted cashews. DELICIOUS!!!! I actually wanted to make spicy-roasted chickpeas. I have never made them at home before. I have seen the recipes on many food blogs, so it couldn't be so difficult to make. I thought. Well, the chickpeas turned out horrible. Not so much the taste, but the texture of those chickpeas was something between wet cardboard and rubber. Not edible. So there I was with a jar full of this delicious Moroccan spice mix. I upped the cinnamon a little and decided to combine it with honey and make sweet and spicy roasted nuts with it. A full success. Just the right combination of nuttiness, sweetness and spiciness. The spices include cumin and cinnamon which are supported by some extra hotness from ground chili. I can't stop eating them. I've got a bowl of them on my desk right now, another container is kept in my handbag so I can have them on the go. Toast the cashew nuts on a baking sheet for about 8 minutes. Take out and let cool a little. In a small pot, combine honey and spice mix and heat gently. Stir to combine. Take off the heat. 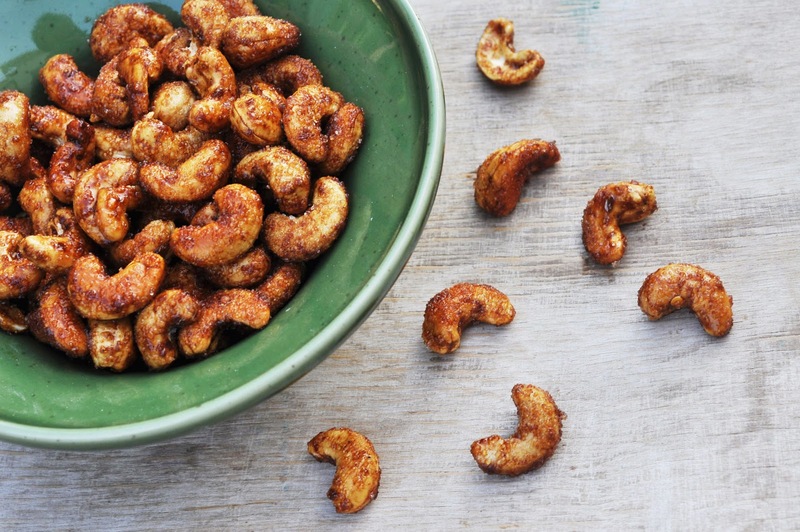 Place cashews in a bowl. Pour the honey spice mixture over them and toss until all nuts are well coated. Place the nuts on the baking sheet in one layer. Bake for 30 minutes. Stir the mixture every 10 minutes to provide even roasting. Take out of the oven and let cool for 2-3 minutes. Combine sugar and salt and sprinkle over the cashews. Toss to coat evenly. Ready to eat.